This Summer seems to have flown by and we have had many enjoyable outings with our Section. August saw us enjoying the sun and a Bar-B-Que in Hazel and Marcel’s beautiful garden. Although the forecast was not great we enjoyed a lovely day and a big ‘thank you’ to them for once again hosting the day. They always go to great lengths to make us feel welcome. Our September meeting was courtesy of David and Margaret Kerr at their home which is in the grounds of the Royal Victoria Country Park in Southampton. After a picnic lunch the ‘chaps’ took off with David for a trip down the Solent on his boat, we did a risk assessment and they decided to take the risk! Meanwhile the ladies ‘took the air’ around the park and visited the Royal Victoria Chapel which has been recently re-furbished and holds a fascinating exhibition explaining the history of the chapel and the Military Hospital which once stood on the site. Although the Chapel is the only building left standing it was once the site of the world’s largest hospital which was a quarter of a mile long. Very well worth a visit. A big thank you to David and Margaret for their hospitality. Our next meeting is on Sunday 18th November at the Fairmile for our last meeting there of the year. January – our first meeting of the Year was well attended at the Fairmile in Cobham. December – we had an excellent Christmas lunch at the Barley Mow. Thanks to Helen & John for all their hard work co-ordinating the bookings, decorating the Hall beautifully, buying the raffle prizes and holding the whole event together. Unfortunately a few people were unable to attend due to the snow but Father Christmas arrived safely. November – our monthly meeting was held at the Fairmile in Cobham on the 19th. We had an excellent turnout of 20 people who all enjoyed a good Sunday lunch. 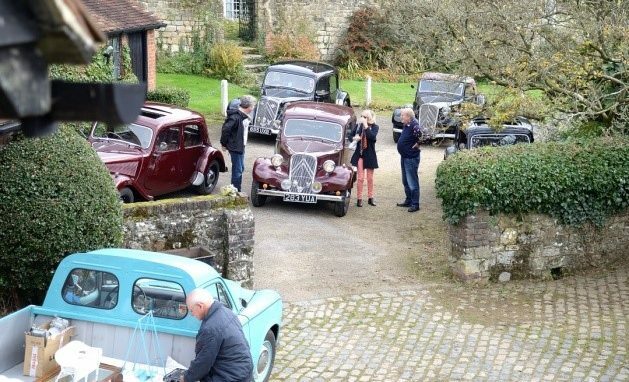 October – a French picnic and table top sale was held on the 15th at the home of John & Nicki Braithwaite near Fernhurst, Sussex. While the men were getting down to the serious business of setting up stalls and buying and selling random bits needed by every Traction owner, the women were given a guided tour of the house. we had been told the house was interesting but nothing prepared us for the Aladdin’s cave within. John gave a witty and informative talk as he led us round, through which shone his and Nicki’s love for their family home. 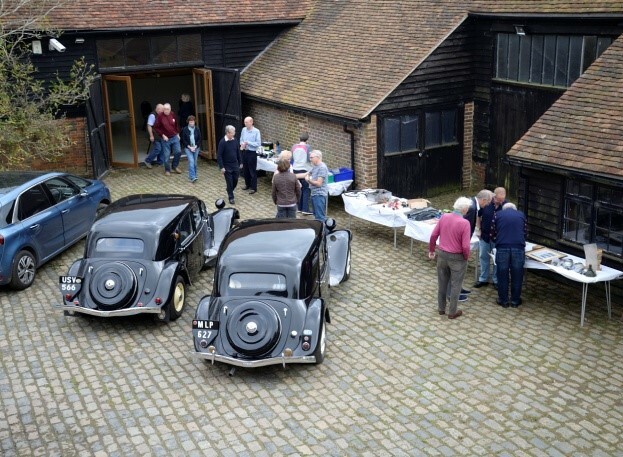 when the buying and selling of Traction bits was complete we set up tables and chairs, hired from the local village hall, and had a wonderful picnic (actually a full scale lunch) organised by Sue & Phil Allison. August – Our monthly meeting in August was a BBQ hosted by Hazel and Marcel at their home. The weather was good and we sat in their lovely garden, the ladies enjoying a catch up while the men discussed the best way to cook a sausage! We would like to thank Hazel and Marcel for their hospitality and for allowing us to descend on them every year. September saw us back at our usual meeting venue The Fairmile in Cobham for Sunday lunch which was well attended. 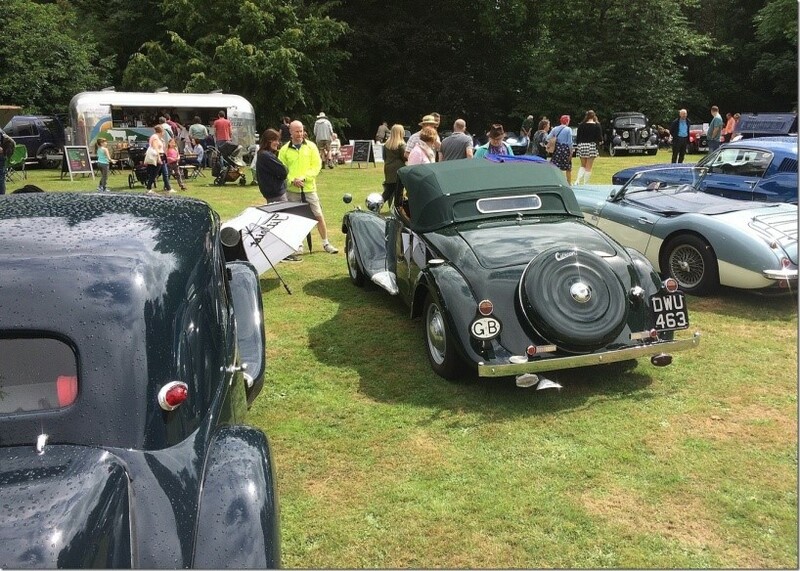 Different members have attended a number of charity classic car shows recently, Capel, Gloucester Goes Retro and Cobham Heritage Day. 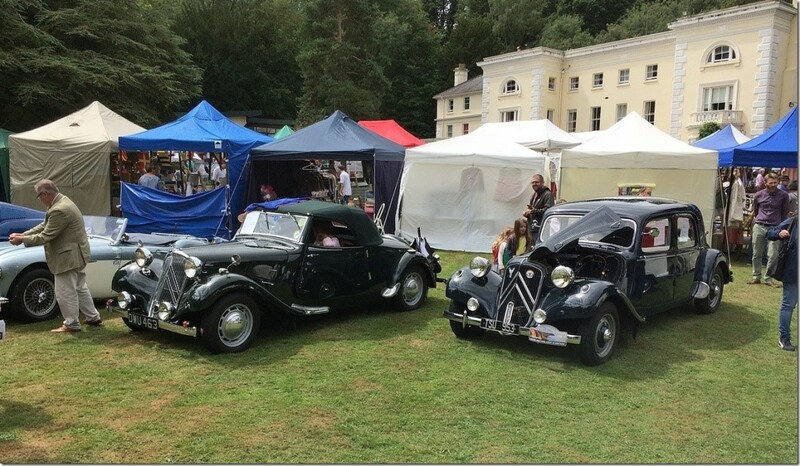 These are great days out and are a chance to educate the general public about the Traction Avant and to raise money for a good cause. A couple of images from “The Meath Epilepsy”, in Godalming, Surrey; a charity event attended by Philippe and myself. The day began with some sunshine, and then the showers became ever more frequent; so much so that the event drew to a close at 14.00 hrs because the rain was so bad. Photo 1: Fellow on the left is wiping down his Healey for the 2nd time, after yet another tremendous downpour.